These personalized blueprints celebrate the "design specs" of your dog's breed. Whether you're smitten with your feisty terrier, nosy hound, or "thinks he's a lap dog" Great Dane, you can celebrate your dog's most adorable attributes with this 1950s-inspired framed art personalized with your pup's name. Created in the style of mid-century blueprints (designed by "architect" I. M. Paws), this detailed illustration is accompanied by "design specs" and documentation about breed origins and temperament. Each one is given a distressed finish, creating the appearance of an authentic, vintage document. From the Airedale to the Yorkshire Terrier and every breed in between, this fetching tribute brings high-design to Man's Best Friend. Made in Portland, Oregon. Check out our regular version of the Dog Blueprints here and the larger version of the Dog Blueprints here! Perfect for a dog lover!! I hang this up in my entryway hallway so all who visit can see this beautiful blueprint of my dog. Planning on buying another one. Perfect Gift for Any Dog Owner! - Big Success!! I loved that it came framed, making it easier to display right away. The hardest part is figuring out where to hang it!! My boyfriend will now have a piece of his beloved Golden Retriever, Busstop, with him where ever he lives! I also love the description of the dog and all the mechanics of its body. All of our friends have also complimented how awesome of a gift it was. Such a unique gift! My boss loved it! Would love one for myself! Going To Buy These For My Dog-Loving Friends!! We had been thinking of buying one of those boat blueprints and framing it for our wall. My husband found this online, so we gave it a shot. What a delightful picture! We had this personalized with the name of our Goldendoodle, and the picture looks just like her! The fact that this came matted and framed is incredible! Really nice quality - looks just like the online representation. 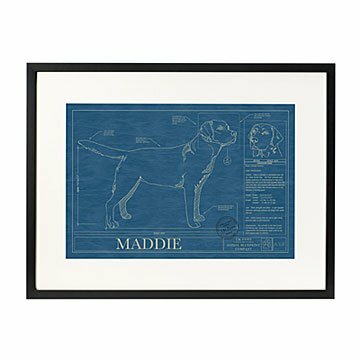 Purchased the large Personalized Dog Blueprint for my father as a Father's Day/birthday gift. Recently, he has become a new dog owner so was overjoyed with the fact that the print had his new dog's name on it. The print was great quality and the frame was in excellent condition upon arrival. Would recommend ordering 2-3 weeks before your event if it is a gift since personalization of anything always takes a little longer. The wait is worth it and will definitely make someone's day. Thankfully I opened the box prior to wrapping it for Christmas. I received the wrong dog with the wrong name. The quality was 'ok'. The backing on the frame was very loose and wrinkled. The vendor claims each product is created by an artist but it's only a print from a template with a computer generated name. Not worth the money it cost. Two years ago we rescued our redbone hound from our humane society. He has been a special dog and a wonderful addition to our empty nest. This blueprint was a a perfect Father's Day gift. We personalized it with his name and couldn't be happier with the quality and uniqueness. We love it! Thank you! Great product to remember a beloved pet. I bought this for my wife after our German shepherd passed away. Great gift and well made.